A teenage Omar Khadr sobs uncontrollably as Canadian spy agents question him at the U.S. military prison in Guantanamo Bay, Cuba, in interrogation footage released by his lawyers Tuesday. The video is of poor quality and the voices are often inaudible, as it was never intended to be viewed by the public. But it shows the Toronto-born Khadr, 16 at the time, being interviewed by Canadian Security Intelligence Service officials over several days in late February 2003. The footage is from five formerly classified DVDs consisting of 7½ hours of questioning that took place six months after Khadr was captured, following a 2002 firefight in Afghanistan. Khadr, who is a Canadian citizen, has been held at Guantanamo Bay for six years on charges that he killed a U.S. medic during a firefight in Afghanistan. Khadr's defence lawyers have repeatedly called for their client to be returned to Canada, arguing he was a child soldier and was tortured to extract confessions. Although he appears reluctant to answer many of the interrogator's questions, Khadr is shown at one point on the tapes saying to his questioners, "Promise me you'll protect me from the Americans." Upon further questioning, during which time interrogators insisted Khadr be clear on the truth, the teen said: "They tortured me very badly at Bagram [detention facility in Afghanistan]." "They tortured you?" the interrogator asked. "And you had to say what you said?" the interrogator asked. The tapes, made public under a court order obtained by Khadr's lawyers, offer a rare glimpse of interrogations of Guantanamo detainees and of Khadr, now 21. The only Western foreigner still being held at the naval prison, Khadr is scheduled to go on trial before a U.S. military commission in the fall. The U.S. Defence Department granted special permission to CSIS and Canada's Foreign Affairs Ministry to question Khadr after he was brought to Guantanamo Bay. A brief video excerpt of the tapes was released via the internet early Tuesday morning, followed by disc copies of the five DVDs made available in the afternoon at the lawyers' offices in Edmonton. 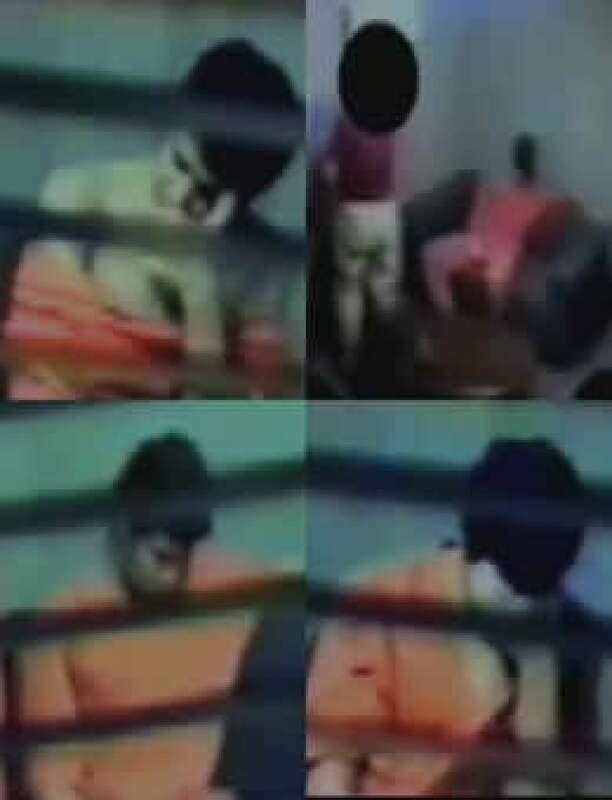 At another point during one of the interviews, Khadr raises his orange prison-issued shirt to show wounds that he says he sustained during the firefight. 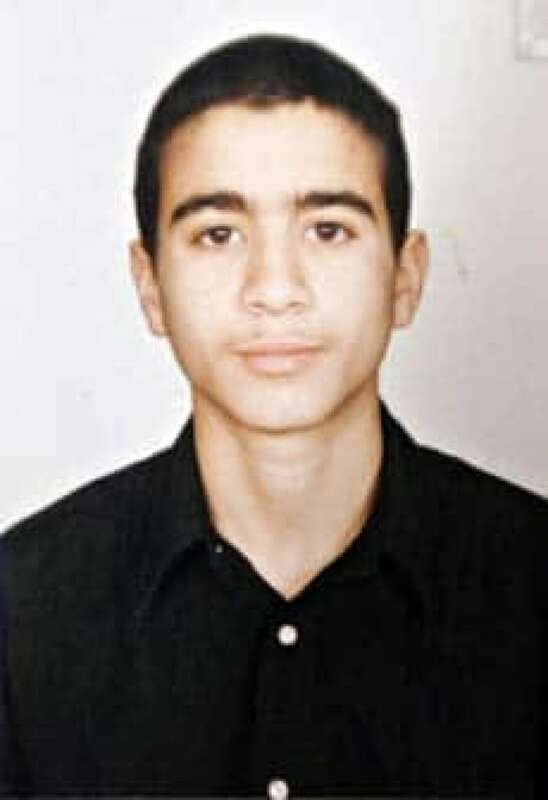 Omar Khadr is shown here at 15, not long before he was captured by U.S. forces in Afghanistan, in July 2002. (Canadian Press)He complains that he can't move his arms and hasn't received proper medical attention. "I'm not a doctor, but I think you're getting good medical care," the interrogator responds. As with all the agents in the video, his face is blacked out to protect his identity. Khadr cries, "I lost my eyes. I lost my feet. Everything!" in reference to how the firefight in Afghanistan affected his vision. "No, you still have your eyes and your feet are still at the end of your legs, you know," a man says. When the agent accuses Khadr of crying to avoid interrogation, Khadr tells the agent between gasping sobs, "You don't care about me." As Khadr continues crying, the agent calls for a break. "Look, I want to take a few minutes. I want you to get yourself together. Relax a bit. Have a bite to eat and we'll start again," the interrogator says. Then Khadr begins sobbing with his head in both his hands, chanting over and over again in a haunting voice. His words are difficult to hear, and at first could be taken for "Kill me" or "Help me." Jim Gould, a now-retired foreign service officer who once visited Guantanamo Bay to assess Khadr's mental and physical condition and was present when the videos were shot, said he thought Khadr should have received "some proper care, custody and probably some treatment." "He had been abused or betrayed by everybody who had been in authority above him — his father, the Americans, the people in the cages or the cells with him. He was screwed up," Gould told CBC News. "I thought at the time and think today he would be a whole lot better off if he was in a different environment. I was quite conscious of the fact he was young, under the age where we would … try him as an adult, and I sympathize with him." Khadr's mother, Maha Elsamnah, emotional after watching her son's interrogation, expressed a deep sense of loss for her family and uncertainty over what she should do. In a brief interview with CBC News on Tuesday morning, Elsamnah — who lives in Toronto — said she feels the need to protect the five children still with her. Her husband, Ahmed Said Khadr, was an avowed al-Qaeda sympathizer before he was killed in fighting with Pakistani military forces in 2003. Elsamnah refused to say more without speaking to her lawyer. But retired soldier Sgt. Layne Morris, who was in the firefight in which U.S. medic Sgt. First Class Christopher J. Speer was killed by a grenade, allegedly by Khadr, said he has no sympathy for the Guantanamo detainee. "Whoever has sympathy for a young snivelling, whining, crying Omar is misplaced sympathy because this is not a man who deserves any sympathy," he told CBCNews.ca. "I use all my sympathy for Chris Speer's widow and two children. I have none left for Omar Khadr." Morris has repeatedly stated he believes Khadr is responsible for throwing the grenade that killed Speer. Morris said the interrogation itself looked mild, and no different than any normal police interview. "Anybody who wants to tell me that was over the top has certainly never been to war and never been to any police interview. Cops are more aggressive than that, geez. That just offends me that anybody is outraged by that knowing the circumstances." Khadr's defence lawyers, however, said they hope Tuesday's release of the videos will spark public support for their efforts. "We Canadians stand for compassion, we stand for the rule of law. And what you are seeing there is the abuse of the rule of law as Canadian courts have indicated about Canadians and Canada's involvement in Guantanamo Bay," lawyer Dennis Edney told CBC News. Edney said Canadian officials should have asked Khadr about potential torture, but instead went into the interview without any help for the then teenage boy. "We don't do that in Canada and that shouldn't have happened to this young, most vulnerable boy in Guantanamo," the lawyer said. He also said Khadr suffers from several injuries, including the loss of sight in one eye and difficulty with the other, as well as shrapnel and bullet wounds. Referring to Khadr's sobbing chants, Edney said, "It's the cry of a desperate young man. He expected the Canadian officials to take him home." But Morris slammed Khadr's lawyers, saying they're more interested in attacking the system than defending their client. "This is just another arrow in their quiver to attack the system and Omar is a convenient vehicle to do that. I think that's an amazing feat to try and sway public opinion in favour of Omar." In May, the Supreme Court of Canada ruled that branches of the Canadian government had to hand over key evidence against Khadr to his legal team to allow a full defence of the charges against him, which include accusations by the U.S. that he spied for and provided material support to terrorists. Several Canadian media organizations then applied for and obtained the release of the DVDs, as well as a package of documents that made headlines last week. The DVDs come nearly a week after internal foreign affairs documents were released showing that Canadian officials knew Khadr had been sleep-deprived for weeks to make him more willing to talk during interrogations. The report says Gould learned during a visit to Guantanamo on March 30, 2004, that Khadr had been put on a "frequent flyer program," meaning he was not permitted to remain in any one location for more than three hours. In another portion of the videotape released later in the day, the interrogator asks Khadr about the 2002 firefight between suspected Islamist militants and U.S. soldiers, and how the fight began. Pentagon officials said Khadr, who was 15 at the time, ambushed American soldiers with a hand grenade after the four-hour fight at the suspected al-Qaeda compound in Afghanistan. In response to a question, Khadr said it wasn't the Americans they had planned on attacking, but the Northern Alliance — the anti-Taliban coalition. "So a firefight started. The Arabs shot at the Americans, the Americans shot back. Did you guys make a decision that you would fight till the end,"
"They made the decision," Khadr replied. Khadr shook his head when asked whether he was going to fight until he died. Asked whether the event overtook him and he had to react, Khadr said: "I had no choice."